What’s the most discouraging aspect of the job application process? Crickets! Candidates said, “no response from employers” was the most likely cause of a negative experience. Digging deeper into employers’ responsiveness in the 2018 Candidate Experience Survey, AgCareers.com asked candidates how often employers notified them about the receipt of their application. Unfortunately, one-third of respondents said they “rarely” or “never” heard from employers with a confirmation receipt indicating follow-up. When a company doesn’t respond to an application, we asked candidates how this impacts their decision to apply for future openings with that company; the clear majority (87%) indicated a company’s lack of response was likely to impact their decision. Forty percent said a company’s lack of response made them very unlikely to apply to future openings. And who’s more affected by lack of response? We found that employed candidates, passive candidates, and those that took longer to apply were significantly more impacted by a lack of response to their application materials. Behind only communication, the interview process is the second most influential candidate experience. 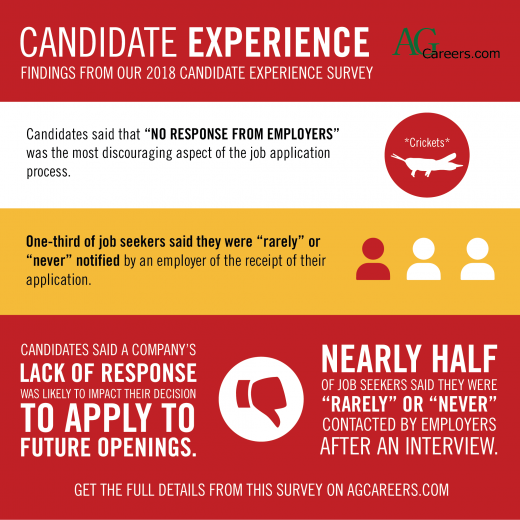 AgCareers.com asked job seekers about their experiences in the 2018 AgCareers.com Candidate Experience Survey. Candidates will evaluate potential employers during the interview, with a direct impact on offer acceptance rates. 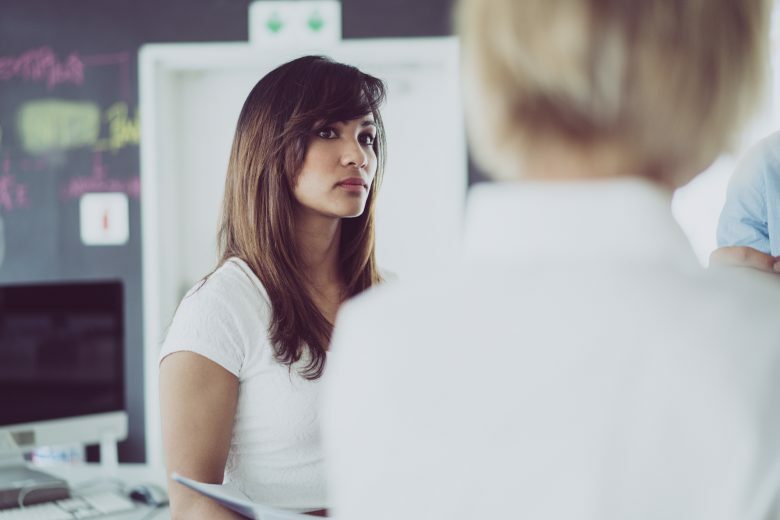 Talent Board has consistently found the top reason candidates drop out of the recruiting process is their perception that an employer disrespected their time during an interview. This can be caused by a manager running 30 minutes late to an interview, an interviewer being ill-prepared, or the actual job not being as advertised. The AgCareers.com survey found that ensuring the actual job description properly aligns with the job posting had the most influence on how the candidate will evaluate the interview. Sufficient preparation by the employer is imperative to make sure the interviewer asks relevant questions, the second most influential factor in creating a positive interview experience. Interviewers’ personalities and knowledge also are influential. Make sure your interviewer can passionately discuss and demonstrate your organization’s core values, mission, and vision. The interviewer should be able to tell the candidate how the role their interviewing for fits into and impacts the organization overall. Plus be ready to discuss continuing education, development programs, mentors and advancement opportunities. Conflict, tension, …whatever you want to call it. Not a favorite for many, but it certainly has its place. It moves the needle. It draws light to areas for improvement. It can draw relationships closer together. You can find it most anywhere. Learning how to work through conflict can ease the angst. 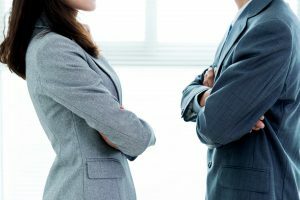 Whether you are having problems with an employee at work or have recently gone through a big change you aren’t liking or having problems at home with a loved one, these three simple things can help you navigate and get a grip on conflict. Take conflict from a negative and turn it into something productive. 1. Stop telling yourself stories – our brain has a way of taking something small (or big) and making it bigger in our minds. You know what I’m talking about. You tell yourself what the other person is thinking, why they are acting this way, and what their feelings and intentions are. We make it up in our heads and I’d venture to guess that at least 8 times out of 10, our story is way more dramatic than it really is. The truth is you don’t know any of these things until you talk about it! Recruiting for your employer is a well-earned honor. It takes a special person to be able to sift through applications, interview candidates, and determine if that person will be a good fit for your company. What if they get a better offer somewhere else? What if they don’t really have the experience you were hoping to hear about? Or what if your job post gets zero applications? Fear not, we’ve got you. And we have all the answers to assist your recruitment strategies. We have been supporting a community of 200,000+ industry professionals through career transitions for 20 years. 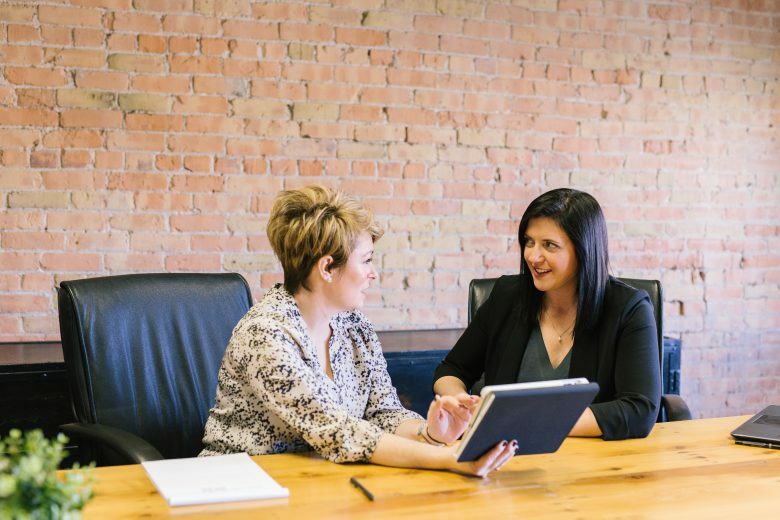 We have the experience, connections and resources to enhance your recruitment strategies to help you find talent perfect for your specific company. Below are 10 ways AgCareers.com can do more for your recruitment strategies. What’s Actually Confidential in HR? “I wanted to stop by and tell you something, but I don’t want you to say anything.” Sound familiar? As an HR professional, it is sometimes hard to know who to tell and who not to tell. It can also be just as tricky to know how to properly safeguard information so that only those that need to know, do. So what’s actually considered confidential? The answer? Much of it. Much of the information kept within HR should be confidential. Employee records must be maintained in such a way that only certain HR employees have access to employee data and information should be closely guarded through proper security measures. What does this mean? If records are electronic, access should be thoroughly safeguarded and if information is paper, it should be guarded via lock and key. Health information must also be maintained with a high degree of security and are generally to be stored separately from an employee’s file. An audit of employee files and safeguarding practices should help you gauge the strength of internal controls around employee information. Generation Z has been entering the workforce over the past couple of years. Just when you feel you have a handle on Millennials (born between 1981-1995) in the workforce, here comes Generation Z (born between 1995-2010). Work environments have changed over the past decade to help create cultures where Millennials thrive. 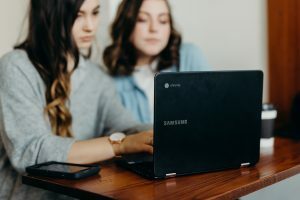 However, Gen Z’s needs can be quite different, which may cause your company to re-think things, as Generation Z takes up a greater percentage of your employee base and will have different workplace expectations. Approximately 73 million people make up Generation Z in the United States. This means Gen Z accounts for about 25 percent of the U.S. population. They are a larger group than Millennials and Gen Xers. Although Gen Z’s demographic profile is still being defined, they will have a big impact on the workforce because of the number of their generation alone. Learning more about Gen Z and their workplace expectations will help your company adapt and change more strategically as you continue to hire more from this new generation. A similarity Gen Z has with Millennials is that they are very comfortable with technology, primarily because it has always been a part of their lives. They are used to immediate gratification through smartphones, Google searches and Amazon purchases. 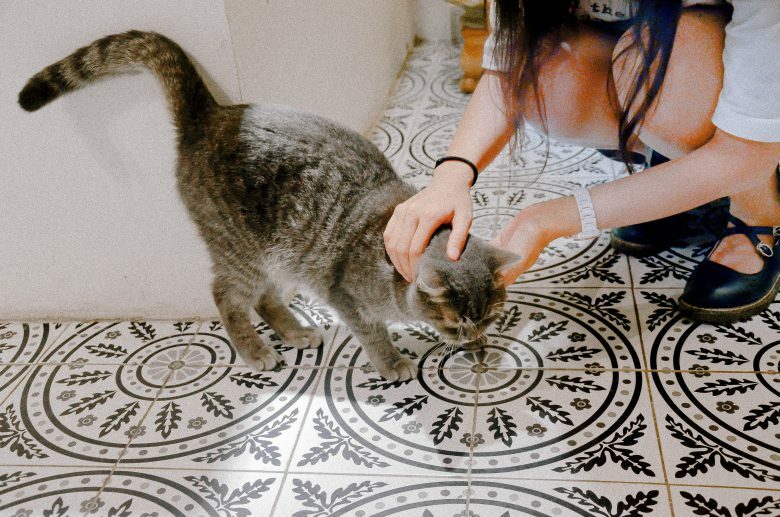 However, most of them have experienced their parents’ job loss and insecurity one or more times, which causes them to view work differently and have different expectations than Millennials. Gender equality in the workplace is a hot topic lately and one that should not be ignored. According to our Gender Roles & Equality in Agribusiness survey that was conducted in 2015, more than 70% of women felt outnumbered by men in agribusiness. The majority of women felt that there was gender inequality in the industry (79%), while only 47% of men felt there was gender inequality in agribusiness. 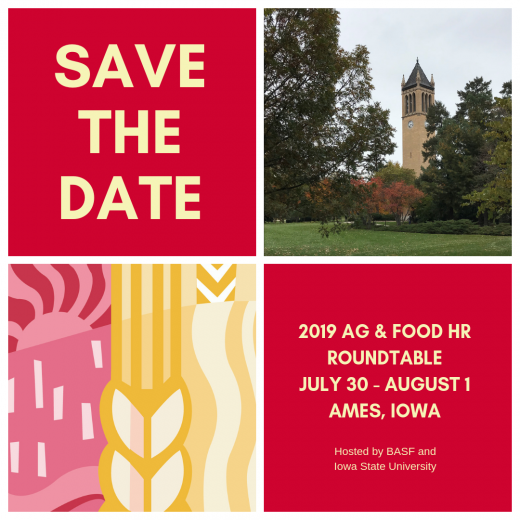 Luckily, more than 80% of both genders felt that the attitude toward a woman working in agribusiness has changed for the better in the past ten years. While this is a large percentage, we still have work to do! Being a woman in the workplace has never been simple. As females, we tend to have more to worry about how we are being portrayed by our peers and can easily be labeled, negative or otherwise. If we are too nice then we are a pushover but if we are too serious then we may be thought to be mean. We also tend to over-apologize for things that are not necessary and the list goes on! Although it has always been a challenge, we will continue to try to close the gap between genders in the workplace. In the meantime, here are a few tips to winning in the workplace as a woman. Constructive criticism is great for everyone but sometimes it is hard not to take it personally. Make sure that you are a good receiver of criticism because in the end, it only helps our personal development. We are often told we are being too “dramatic” or “emotional” if we are passionate about a certain topic or if we react a specific way. This can be frustrating so keeping a level head in every situation encountered is important. If you employ skilled labor and skilled trade professionals, you don’t need anyone to tell you there’s a shortage of candidates. You’ve likely been swapping experienced employees back and forth with your competitors routinely. It’s a miracle to be able to find and net new talent with the experience needed. My colleague Jessica Bartow and I recently gathered human resource professionals from agricultural employers in Tulare, California and surrounding areas to discuss the skilled trade shortage, and we identified five strategies they use to try and keep the candidates flowing. The tactics below can serve as a quick checklist. If you are finding it challenging to attract people to your skilled positions, it’s time to ensure you’re developing programs like the ones below. Employers shared that some had lost previous employees due to overtime payment, or rather the lack thereof. Employees had grown to expect being paid overtime, and when they did not end up working the extra hours to receive payment they left to go elsewhere. One company stated that they have paid their overtime early to stay ahead of the curve and guarantee the pay for their employees. It was a shared feeling that most employees might not be aware of the entire package they receive from their work, including overtime pay and standard wages. 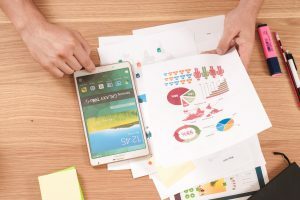 A recommendation that stood out was to educate employees by using a chart to show the entire breakdown of the net pay and benefits each employee receives.